Those lines in question would be the new flooring. A distracting checkerboard of black tarmac and grey tiles, the idea seems to have been to break the vast expanse of tarmac in the old land, highlight routes between the attractions and generally give a more campus/courtyard feel. Like the Ink of “Ink & Paint”, it’s all dark colours so far and appears to be staying that way – the same design has now reached right across from Flying Carpets Over Agrabah to Disney Bros. Plaza. The full extent of the finished makeover was revealed this past Tuesday, when 9-month old fences were finally removed from the area between Disney Studio 1 and the Monsters Inc Scream Scene. The removal of the fences must have been a breath of fresh air for the park – finally a little room to breathe and the first step of the final touches for Toon Studio. The next steps were all made clear behind the fences, such as the Sorcerer Mickey entrance statue due in the new planter above. The portion which will house the statue is actually separate to the existing section, allowing another small route through to the current Animation Courtyard without stepping under Mickey’s spark of golden pixie dust. Either the Imagineers are planning for people with superstitions, or they realised the entrance could become totally blocked in the lead-up to parades! With the Fantasia hippos now residing along the Studio Tram Tour route, what’s to be found at their old home? Currently, not a lot. But the colourful planting does mix well with the sea of blue, whilst cleverly following the checkerboard pattern of the flooring around it. As for Animagique, the Studio 3 theatre of the backlight show is still in post production, with fences covering the edges of its waiting area roof as more areas are repainted in the Toon Studio colours of blue, navy blue, pink and purple. No other improvements have been spotted yet, but the fences do encroach quite a way onto the path – more than might be necessary if they’re simply repainting. Can we hope beyond hope those flower beds from the concept art make it to reality, rather than going the way of the quickly-forgotten fountain? The clean-up animation department has also been at work recently, adding a few extra touches to a project everyone assumed was complete. Whilst every concept showed the huge billboard façade of Crush’s Coaster with straight, cropped edges, the deep and light blue tones have now been extended across its bordering walls, allowing them to fade out. Unlike animation, the Imagineers could make this change very quickly, and the mural now appears better integrated than before. All of this is essentially the work of background artists, with the placemaking creating a better environment for guests to experience the attractions themselves. The background work is clearer nowhere more than at the Toon Studio entrance gate – the one to be used only by Toons of course – which continues to receive more details such as two photolocations, various props for the security booth and finally the “Toon Town” letters in the hills beyond. Unlike the papier-mâché 3D versions at Disneyland in California, their flat 2D design recessed into the “hillside” is also illuminated throughout the day. And finally, more characters are soon to arrive. Maybe a cheap way of fulfilling the resort’s pledge of “More Disney characters than ever before”, the lighting rigs along the parade route are about to have their posters returned following the storms late last year. A Cast Member sent a photo into our partner site WDSFans.com taken from the other side of the parade access gate, showing the first poster to be fixed in place, facing away from the park. Does it look familiar? 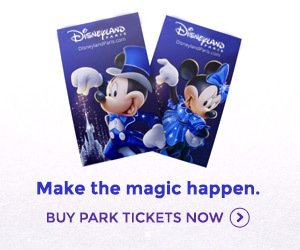 Yes, the esplanade posters of Hong Kong Disneyland have made it almost half-way around the world to Paris, albeit in a slightly cropped format to fit the lighting rigs. Expect all of the on-stage rigs to be given their own characters – from Bambi to Mowgli, Lilo & Stitch to… Lumière! Well, when there’s a banner at Disneyland Resort Paris, you can be sure that candlestick won’t be far away! You can see the full set of Hong Kong banners at LaughingPlace.com here. The only thing left to do soon will be to run the reel, and for this Walt Disney Studios has another small trick up its Sorcerer’s Apprentice sleeve. As confirmed by Kinoo on magicforum, a “Toon Train” will arrive on the Toon Studio lot each morning, with rumours also of special musicians on a small float as the animation stars arrive at work! All other photos by Photos Magiques – you can see even more here.